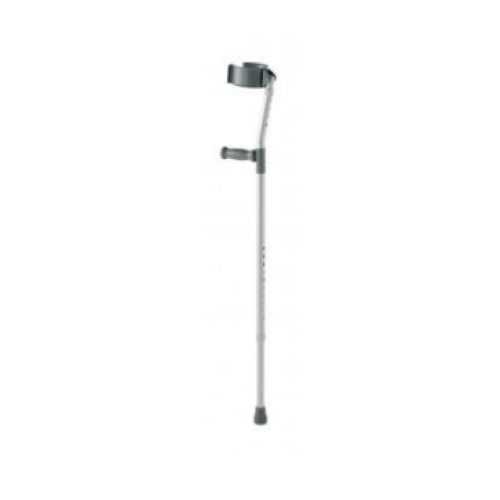 Adult Forearm Adjustable Crutch by Carex is designed for long term use, the adjustable Carex adult forearm crutch has an orthopedic handle for comfortable use and the forearm cuffs are vinyl coated. Both the height of the handgrip as well as the height of the cuff height can be made independently to make for an extremely comfortable fit. Crutch measures 30" to 39" from hand grip to base in 1" increments. 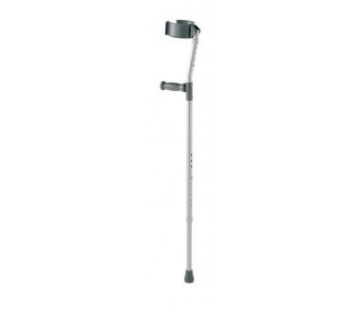 Another option for crutches are what are known as the Lofstrand or forearm crutches and the same idea applies. You are going to put your forearm through. Hold the handles and you want these so that they’re about a 30-degree bend in your elbow. They’re typically adjustable at the bottom and what you’re going to do is going to same rules apply as your crutches are an extension of your bad leg. If my right leg was my injured or operative leg, when my crutches go forward, my right legging come to joint it and then I can step through and these can be used in as much of a weight bearing fashion as possible. If I’m just trying to use them for balance, that’s fine. If I need to be completely weight bearing, I can put all my hands on my arms. Going up and downstairs with the Lofstrand crutches, what you’re going to do? Same rules apply. Up with the good, down with the bad. If my right leg is my operative leg, I’m going to go up with my good foot and then come up with the crutches and my bad foot. Again, up with my good and then up with my bad. On the way down, I’m going down with my bad foot and then down with my good foot. To repeat that, down with the bad and the crutches, and then down with my good foot.